To be a truly great Texas Hold 'Em Poker player, you need to be able to read your opponents, ascertaining when they are bluffing and then they really have a solid hand. But learning some basic strategies and general rules will go a long way toward making sure you can at least hold your own in a friendly game. It may seem silly to be reminded of the following fundamental facts, but it's surprising how often players get swept up in the excitement of the game and forget the basics. 1. The two cards you hold are the only cards that set you apart from the other players and give you the chance to win. 2. All of the face-up cards are community cards, shared by you and every other player. It's vital that you focus on what those cards could mean to someone else at least as much as you focus on what they mean to you. In particular, keep your eyes open for your opponents' straight and flush possibilities. How do you know if your cards are good? It depends in part on how many players are in the game, but a general rule is that you should seriously consider folding before the flop if you have two non-pair cards, both less than 10. A more conservative player might fold if just one of the cards is less than 10; a more aggressive player might stay in with, for example, an 8 and 9 of the same suit (because those cards give you decent possibilities for a straight or a flush). If the big blind (a forced bet designed to ensure that every hand has a pot) is low enough, it may be worthwhile to pay in so that you can see the flop even if you don't have particularly strong cards in your hand. But don't abuse this exception to the rule -- it can get you into trouble more quickly than you imagine. A lot of Texas Hold 'Em strategy is based on the cards in your hand. You must be willing to suffer through a series of poor hands (e.g. 5-8, 2-6, 4-9) without getting impatient. The good hands will come, eventually, and you'll be in better position to take advantage of them if you don't waste your chips trying to get something out of nothing. After seeing the flop, don't be afraid to cut your losses. A common mistake made by novices is to decide, "I'm already in this hand, so I might as well play it out." Wrong. 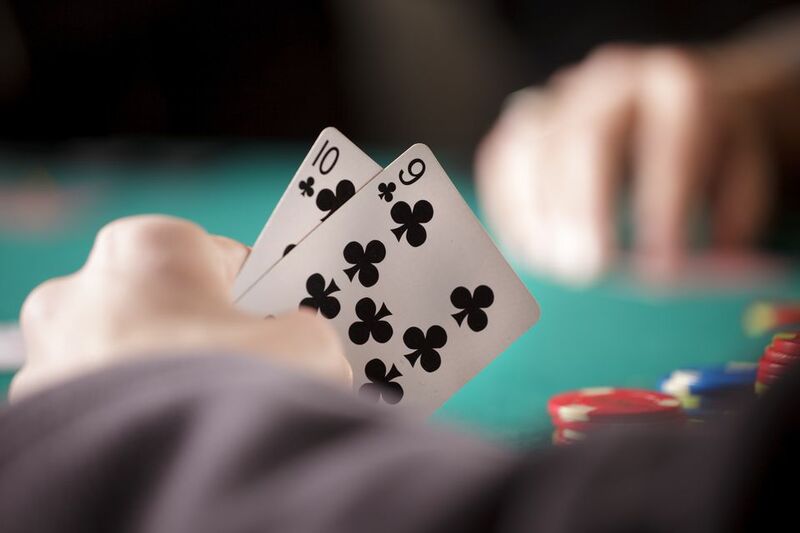 With seven players at a table, two pair or better will generally be the winning hand. If you don't have the high pair after the flop (e.g. if the flop is K-9-5, the high pair would be two Ks), and you're not in good position for a straight or a flush, you should probably get out of the hand. However, remember that as the number of players goes down, so does the potential of a strong hand -- so if you're at a table with just two other players, it could pay off to be more aggressive. If you're first to bet after the flop, don't be afraid to check. This can work to your advantage in two ways. First, if your hand is on the weak side, you might be able to see one more card without having to put more into the pot. Second, if your hand is strong, you could convince an opponent or two that it's weaker than it really is. Also know as The Turn and The River, respectively, the fourth and fifth community cards give you two more chances to either get out of the pot before you lose even more money -- or increase your winnings. At this point, it's likely there will only be one or two other players still in the pot with you. The best advice here is to be cautious. After fourth street, don't stay in the pot hoping for a straight or flush, unless you can do so on a check (that is, without putting more chips into the pot). Although there will be times when you would have drawn the straight or flush, they will be outweighed by the times you wouldn't. The bottom line is this: Don't allow yourself to get sucked in too far with a weak hand. That said, there is a point where the investment you've already made virtually dictates that you hang in there. It's useful to measure this in terms of percentage of your chips. For example, if you've already committed 40% of your chips to the pot, another 5% isn't that much. This is a gray area, so once again the best advice is to be cautious.